The JEFFCO 310 SAN FRANCISCO Trolley Has It All! 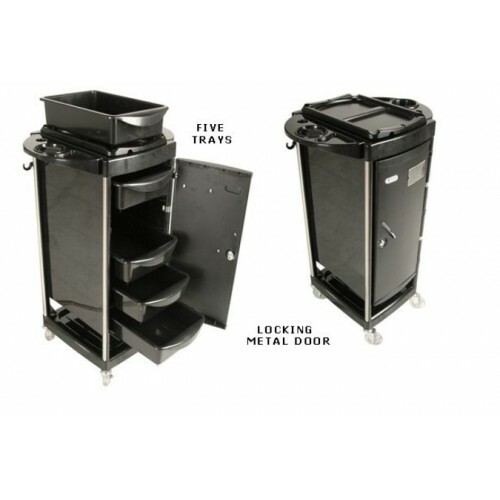 Locking metal cabinet door secures 5 removable drawers. Each side edges can come up to accommodate two color bowls, two hair dryers, or two curling irons. This cart has a removable Hot Top, perfect for placing hot flat irons or other hot instruments down while working. The heat resistant top can be taken off and hung on the side of the cart giving you extra working space on top of cart.. Heavy duty easy-rolling caster wheels. Cart measures: 34.75"H x 12"W x 16"D. **when sides ledges are extended - cart measures 21"W.
The inside drawers each measure 8 1/2" x 13" x 3 1/4".